NEW ORLEANS – We’re less than one month away from the NCAA Division III Cross Country Regional Championships, which will take place Saturday, November 10 across the nation at various sites. With that known, the Men’s and Women’s Regional Rankings are beginning to evolve, as evident in the newest batch of rankings released Tuesday by the U.S. Track & Field and Cross Country Coaches Association (USTFCCCA). 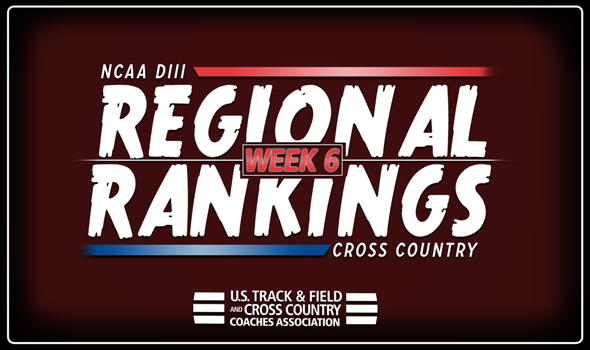 The USTFCCCA Regional Cross Country Rankings are determined subjectively by a single member coach in each respective region. The regional representative is tasked with weighing returning teams’ strength with current season results (if applicable) in determining predicted team finishes at the NCAA Regional Championships, which will take place November 10, one week ahead of the NCAA Championships in Winneconne, Wisconsin, at the Lake Breeze Golf Club. SUNY Geneseo tops the men’s list for the first time this season after a strong performance at the Inter-Regional Border Battle this past weekend. The Knights finished runner-up to Johns Hopkins, ahead of former No. 1 RPI. SUNY Geneseo wasn’t the only team that stood out at that meet, as SUNY Oneonta finished fifth and jumped five spots from the previous week to No. 3. St. Lawrence and NYU round out the new-look top-5 in fourth and fifth, respectively. SUNY Geneseo held its ground atop the women’s list after finishing runner-up at the Inter-Regional Border Battle. Behind the Knights you’ll find Rochester (N.Y.), which also competed at the Inter-Regional Border Battle and finished fourth. The Yellow Jackets topped both St. Lawrence and RPI, which both dropped one spot from the previous week. Vassar rounded out the top-5 once again. St. Olaf took over the No. 1 spot in the men’s list after finishing fourth at the Jim Drews/Tori Neubauer Invitational this past weekend. The Oles were led by Thomas Lerdall, who finished sixth individually. Former No. 1 Wartburg fell one spot to No. 2, while Carleton remained at No. 3. Cornell College jumped two spots from No. 6 to No.4 after a solid showing at the Kollege Town Sports Invitational. St. Thomas (Minn.) sits No. 5 this week. There were no changes to the top-5 of the women’s list. Carleton is still No. 1, followed by No. 2 Nebraska Wesleyan, No. 3 Wartburg, No. 4 St. Olaf and No. 5 St. Thomas (Minn.). Calvin and Otterbein remained No. 1 and No. 2, respectively, in the men’s list. DePauw jumped three spots from No. 6 to No. 3 following a favorable result at the Kollege Town Sports Invitational, while Case Western Reserve fell from No. 3 to No. 4 and John Carroll stays at No. 5 for the second week in a row. The top-3 teams in the women’s chart maintained their spots from the previous week: No. 1 Hope, No. 2 Calvin and No. 3 Otterbein. Oberlin jumped five spots from the previous week to No. 4 this week. The Yeowomen hosted the Inter-Regional Rumble this past weekend and captured the team title with 77 points over Case Western Reserve, which is ranked fifth. Haverford remained No. 1, but has company in an emerging team from Johns Hopkins. The Blue Jays jumped up to No. 2 this week after winning the Inter-Regional Border Battle this past weekend. Carnegie Mellon dropped to No. 3 following its fourth-place effort at the same meet, while Dickinson and Stevenson stood their ground at No. 4 and No. 5, respectively. The top-3 teams in the women’s list held serve this past weekend as No. 1 Johns Hopkins won the Inter-Regional Border Battle, No. 2 Dickinson finished runner-up at the Connecticut College Invitational and No. 3 Carnegie Mellon finished well at the Inter-Regional Border Battle. The No. 5 team from last week, Misericordia, is now ranked No. 4. York (Pa.) went from the Land of the Not Ranked to No. 5 after a strong performance at the Inter-Regional Border Battle. North Central (Ill.) isn’t moving from the top of the men’s list any time soon, but there were a bunch of changes behind it. Washington (Mo.) is now ranked No. 2 after finishing runner-up to the Cardinals at the Kollege Town Sports Invitational. UW-La Crosse dropped to No. 3, while fellow state mate UW-Stout climbed one spot to No. 4. U of Chicago comes in at No. 5 this week, a one-spot drop from the previous week. Washington (Mo. )’s women kept a hold of the top spot, but there was some jostling for position behind it. Wheaton (Ill.) jumped one spot from the previous week to No. 2 after finishing fourth at the Kollege Town Sports Invitational. The Thunder’s move sent UW-Eau Claire down one spot to No. 3, while U of Chicago and UW-La Crosse each moved up one spot from No. 5 to No. 4 and No. 6 to No. 5, respectively. The top teams in the men’s list squared off at the Connecticut College Invitational this past weekend and the results from the meet hold true in the newest batch of rankings. Amherst won and with that victory, comes the No. 1 spot in the New England Region. Williams finished a game runner-up to the Mammoths and is ranked No. 2. Middlebury finished a distant third and is ranked No. 3. Tufts finished fourth in the meet and jumped two spots to No. 5, right behind fourth-ranked MIT. The women’s list looks similar to the results of the Connecticut College Invitational that was held this past weekend with one exception: MIT didn’t compete and remained No. 1. Other than that, Middlebury won the meet and is now ranked No. 2. Tufts remained at No. 3 after a third-place showing, followed by fourth-ranked Brandeis (which raced at the Kollege Town Sports Invitational) and Williams. Rhodes maintained its top spot in the men’s list after a strong effort at the Kollege Town Sports Invitational. Behind it, Emory and Washington and Lee both jumped one spot from No. 3 to No. 2 and No. 4 to No. 3, respectively, following their efforts this past weekend. Berea (Ky.) dropped two spots from last week, while Lynchburg (Va.) climbed into the top-5 at No. 5. The top-2 teams in the women’s list remained in place from the previous week: No. 1 Emory and No. 2 Lynchburg (Va.). Behind them, Trinity (Texas) jumped two spots from No. 5 to No. 3 after a strong performance at the Inter-Regional Border Battle. Washington and Lee stayed at No. 4, while Centre fell two spots from No. 3 to No. 5. There weren’t any changes to the top-5 of the men’s list this week after a busy weekend of racing across the nation. Pomona-Pitzer is still No. 1, followed by No. 2 Claremont-Mudd-Scripps, No.3 UC Santa Cruz, No. 4 Occidental and No. 5 George Fox. There were no changes to the top-5 of the women’s list as Pomona-Pitzer, Claremont-Mudd-Scripps, UC Santa Cruz and Occidental sit in order. Redlands jumped five spots from Week 4 to Week 5, coming in at No. 5. The Bulldogs were the top finishing NCAA DIII program at the Highlander Invitational.